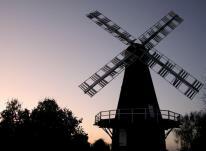 Meopham Village, Gravesend, Gravesham in Kent - Visit Kent. Famed as one of the longest villages in England and with one of the best kept cricket greens in the country. 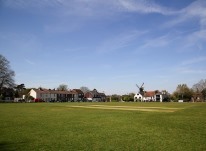 Overlooking the quintessential village green is Meopham Windmill with its near neighbours the Cricketers’ Inn and the Kings Arms, both recently refurbished, the later reputedly one of many places King Charles I stayed during the Civil War. Other distinguished names linked with Meopham include Simon de Meopham (1272-1332), an early Archbishop of Canterbury, and the Tradescant family, remembered for their contribution to horticulture and the collecting of specimen trees and plants from across the world. Camer Park’s 46-acre grounds are now a country park and open to the public all year round and the 14th century churches of St John’s Church, Meopham and St Mildred’s Church in Nurstead are worth a visit. Occasionally, Nurstead Court is open to the public for events.